The Shopping Channel is offering you the opportunity to secure a $500 Gift Card, spendable at their online shop. How? It’s very easy. All you need to do is vote for your favourite brands in the TSC 12th Annual Shoppies Awards. Then, you’ll be automatically entered into the draw. 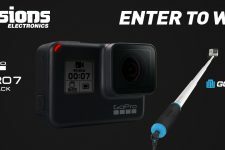 This contest ends on February 15, 2019, so make sure you enter before it closes.